A unique interprofessional team is transforming the care and improving the quality of life of people with dementia by providing education, support and advice to those caring for them. Specialist nurse practitioner Lorraine Haining leads the IDEAS team – Interventions for Dementia, Education, Assessment and Support – a consultancy that improves carers’ and care teams’ understanding of stress and distress, and helps them take steps to reduce and prevent it using evidence-based, non-pharmacological approaches. 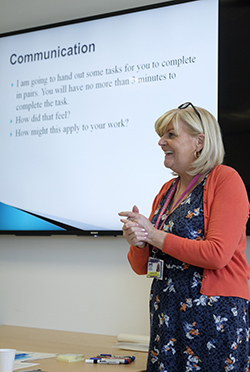 Ms Haining has developed and actioned a stress and distress pathway, and delivered engaging and accessible training programmes to more than 1,900 people. Her commitment to improving the care of people with dementia and compassionate and effective leadership saw her named winner of the Nursing Older People category of the prestigious RCNi Nurse Awards 2018, the profession’s top accolade, at a glittering ceremony in London on 4 July. After a successful two-year pilot in care homes in Dumfries and Galloway, the IDEAS team, which comprises a speech and language therapist, psychologist, social worker and occupational therapist, was first extended to general hospitals, then to all settings where a person with dementia might live or spend their time. Training has been completed by staff in NHS Dumfries and Galloway, social care and the independent and third sectors and there is a waiting list. It has been described in feedback as ‘enlightening’ and ‘excellent’. ‘We have moved away from PowerPoint presentation to experience learning,’ says Ms Haining. ‘When we opened the training up to any service across Dumfries and Galloway people from all disciplines came through word of mouth. It is very enjoyable. Now we have waiting lists. ‘The diabetes team is working with us now, which is a huge opportunity, and I want to do something regular with dentists. I just ask people and nobody really says no,’ she adds. Once the training is complete, participants receive regular mailings and updates to maintain, encourage and support their interest in dementia care. The team provides bespoke training where knowledge, skills and practice issues have been identified, supporting organisations and staff to make the necessary improvements. Ms Haining says: ‘We also carry out specialist assessments and interventions for complex presentations of stress and distress in people with dementia. ‘If a care team is having difficulty with a situation they contact us through community mental health teams and we can work with the person and staff, modelling the highest level of care. Dementia care mapping is central to the team’s non-pharmacological approach, as is an evidence-based pathway designed and developed by Ms Haining. ‘Dementia care mapping helps staff recognise and further embed good practice and take person-centred care approaches,' says Ms Haining. 'They are empowered to develop action plans and implement more meaningful activity to improve the quality of care for patients on the ward. The team’s results are impressive. There was a 76% reduction in inappropriate antipsychotic prescriptions during the pilot project and a reduction in admissions to acute care. Staff report having a better knowledge of dementia and confidence in dealing with distressed behaviour and in a survey, 100% of staff said they would recommend the IDEAS consultancy service. Ms Haining talks proudly of individual clinical outcomes (see box for case study). ‘One gentleman we were asked to help with was pacing around corridors at night. We discovered he had been in the navy during the war. We looked at his environment and the big window was open and he saw water in the distance and thought that is where he was. ‘We helped staff understand that if they let him walk up and down for a while then told him “that’s your shift over, go back to your bunk” he would. It is about knowing the person and their background. It makes sense what their behaviour is. Ms Haining was nominated for the award by occupational therapist Jilly Polson. ‘Lorraine is indispensable,’ she says. ‘She seeks and makes opportunities to champion the rights of individuals with dementia and her vision for them is her driving force. ‘Her enthusiasm and dedication have promoted the extremely important role of nurses in all settings in caring for people with dementia, enabling them and others to shine and fulfil their potential. ‘She has raised awareness of the vital importance of physical health factors especially delirium and through her passion has developed and increased understanding and implementation of non-pharmacological interventions for stress and distress. 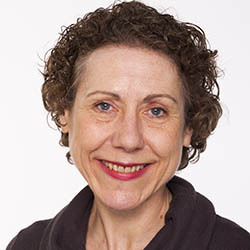 RCN professional lead for older people and dementia care Dawne Garrett adds: ‘Lorraine has been described as indispensable and instrumental in developing her service. I would like to add that she is inspirational. An 82-year-old woman living in a care home was referred to the IDEAS team by a community mental health team. For the past few months she had been presenting with very distressed behaviours, which were beginning to upset other residents. Staff were struggling to cope. The woman was constantly shouting for help, pressing her buzzer throughout the day and night. The only thing that helped the situation was staff being on a constant 1:1 with her. Other residents were becoming intolerant of the behaviour and staff felt she was in danger of them retaliating. At initial contact she presented as highly anxious, frightened and emotional, fearful for the future, with a sense of hopelessness and markedly depressed. The Challenging Behaviour Scale (CBS) was completed resulting in a score of 109/400. An Abbey Pain Scale produced a score of 12/18 indicating moderate pain. Staff had undertaken IDEAS training and behaviour charts were completed in detail which indicated a possible underlying depression and a Hospital Anxiety and Depression Scale was completed with a score of A:9 D:14 indicating anxiety and depression. There was little information in terms of a ‘This is me’ document or life story due to the fact she had been admitted in an emergency and had no living family. The IDEAS team worked with care home staff to formulate her unmet needs and identify appropriate interventions, which included a transdermal patch for her chronic back pain and antidepressants. Efficacy was measured using the baseline assessment scales. Formal training on depression in older people was developed for staff so they were able to recognise signs and understand treatments and this was delivered over two sessions. Life story work helped staff gain a better understanding of the woman to fully inform person-centred care plans. By the end of July incidents of distressed behaviour were almost non-existent and her CBS score was 12/400. The Abbey Pain Scale was also repeated and the score had reduced to 3/18 indicating mild pain on occasion. Her mood was significantly improved, with a marked reduction in her levels of anxiety. She was more accepting of personal care and was less isolated since her pain was addressed. She acknowledged improvement and was delighted to be ‘feeling so content’. Ms Haining is passionate about what she does and feels lucky to be able to maintain her clinical role while leading a service. ‘I love my team – they are all as creative and as passionate as me,’ she says. ‘I always had an interest in behaviours, but that was the bit the government was not as good at funding. Current plans include a piece of work looking at the evidence in using the stress and distress pathway on wards and a focus on how the team can support staff. Future additional work includes focus groups to explore embedding into practice and outcomes that participants in training have put into place. And Ms Haining continues to work tirelessly to raise the service’s profile through presentations at conferences, social media, local media and building relationships with organisations. Other health boards have shown interest in her unique service. ‘There is no magic wand to get to end point where a person with dementia is free from distress. It is hard work and there is a process. Sometimes people go off the pathway or try to cut corners so we make sure people understand that if they follow the process they will get there in the end,’ says Ms Haining. This team developed and implemented a continence care bundle in two care homes to support staff in improving care of residents and reducing the high use of absorbency products. An economic analysis by Healthcare Improvement Scotland found that the pilot saved £250,000 over the nine-month period in the nursing home involved in the project. Advanced nurse practitioner Debbie Shaw has significantly improved care for patients through her creation and leadership of an innovative and responsive older people's mental health liaison team at Walsall Manor Hospital. The team prevents admissions where possible, reduces length of stay and improves patient experience and outcomes. Nurse consultant Geraldine Rodgers led the creation and implementation of the Significant 7 tool designed to enable care home staff to identify deteriorating residents. Audit had identified a high number of hospital admissions from care homes, many inappropriate. This team introduced Playlist for Life, personally meaningful music to improve a person with dementia’s quality of life and reduce anxiety, to its care homes and day care. It organised training for 20 champions who disseminated their knowledge and encouraged families and caregivers to create music collections.